Access: from Soffranco (S.S. 251 at 6 km from Longarone) follow Val del Grìsol up to Pónt de la Costa Granda (3.5 km), cross the bridge and follow the forest road climbing along the right side of Val dei Ross (trail marker to Pian de Fontana Mountain Hut); after eventually parking your car after about 1 km (at Pont dei Ross, altitude 765m), continue along the trail leading to the Mountain Hut (trail marker CAI 520), up to 1,388m where you will find the rural settlement of Casèra de i Rónch (1.30-2.00 hours of walk). Environmental context - Description of the site: Val del Grìsol, situated at the edges of the north-eastern section of the Park, offers an environment particularly rich in naturalistic features (geological and vegetation interest) and historical-human features; perpendicular to Valle del Maè, where it enters at Soffranco, it represents an important gateway to the protected area. The complex trail network branching off from the valley gives the opportunity to reach the most important areas of the Schiara mountain group. Val del Grìsol and the lateral valleys coming together with it (including Val dei Róss) are characterized by often steep woody slopes alternating with grassy plateaus; the richness of these valleys consisted of the wood exploitation but, despite the unfavorable morphological conditions, there are also several "malghe" that in the past were open to the summer mountain grazing. In order to exploit the pastures of the different altimetric plans, the "malghe" (both of public property and private property) were organized in "clusters" and connected by a network of mule tracks; after using the pastures at lower altitudes, the cattle was gradually led to the pastures situated at higher altitudes, following the usual routes. With the abandonment of the ancient practice of the migration to the summer pastures, the latter have suffered a considerable reduction because of the natural invasion of the wood and, in some cases, of artificial reforestation measures. Situated within the administrative borders of the Municipality of Longarone, Val del Grisol lies only in part within the Park borders. Architectural features: medium-small size rural complex of "malga". Great historical – environmental interest. The nucleus consists of more buildings set out on the same contour line, one next to the other, in the middle of a grassy slope sometimes steep: two stables, one open and one closed, the "casèra" for the deposit of the cheese products, and the milk booth are the built elements of the "malga", that could house even 100 heads. They are structures partly in brickwork, partly in wood, covered with sheet and with building features strictly linked to the available resources. The "casèra" is formed by a room used as a kitchen with a fireplace to cook the cheese and for the refreshment, open. From the kitchen you can reach the "caneva", a premise where the cheese is preserved on several shelves. This premise, very small, has a few and little openings shielded with bag cloth so that the products do not dry up. The stables, built one entirely with wood, the other in brickwork, have a rectangular plan and two coverings; situated on a slight slope to favor the cleaning, they have large openings on their short sides for the passage of cattle. Inside, at the two ends of the building, a small-size wooden partition creates a space in the attic; here a modest quantity of hay was preserved for the days in which grazing was not recommended. However, also the guardians used to sleep here. The "casel del lat" is separated from the other premises for the specific needs of the product to preserve: in the booth, milk was deposited after the morning and evening milking. The eastern wall has a large characteristic opening (originally with wooden frame, so that air could circulate maintaining a low temperature within the premise), the brickwork parts, also of the other walls, are characterized by several slits enabling a good ventilation without letting the sun rays in. Inside, in one or more cement basins, originally in wood, filled with the very cold water taken from a nearby spring or creek, the milk containers were kept cool. 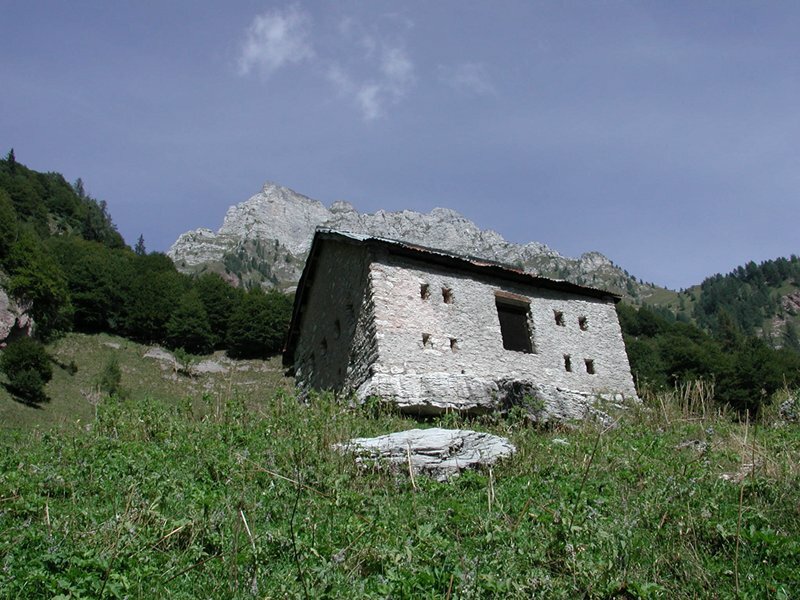 Structures for summer mountain grazing (shelters for the cattle and the guardians, premises for the preservation, processing, and deposit of the cheese products), in a rather good state of conservation (the structures were recovered in 1945), abandoned since 1958. Malga I Ronch, place along one of the several historical itineraries of the migration to summer pastures involving this area, was linked to Pian de Fontana (1,632m, now used as a Mountain Hut) and La Cengia (1,346 m), all property of the Municipality of Longarone. The trail connecting I Ronch and La Cengia has been recently recovered by Dolomiti Bellunesi National Park within the recovery measures of the trail network of Val dei Ross. I Ronch could welcome eve 100 heads that used to graze here for 40 days (simultaneously also in the pastures of La Cengia where there were only small shelters) to climb then to the higher altitudes of Pian de Fontana (here the calves were separated and brought at even higher altitudes in Van de Zità, at 2,030m in a wonderful glacial basin at the edges of which the rests of a dry-stone structure are visible; during the return journey, the cattle used to stop again at I Ronch, where the period of summer grazing finished (for the municipal "malghe" this period started on 1st June and ended on 7th September). Casèra de i Rónch was used until 1958, the "malga" in Pian de Fontana until 1968. De Vecchi G. - Tre aspetti delle attività silvopastorali nel Longaronese prima del 1963, Istituto Bellunese di Ricerche Sociali e culturali, Serie "Quaderni", N.3; Tip. Piave, Belluno 1977.